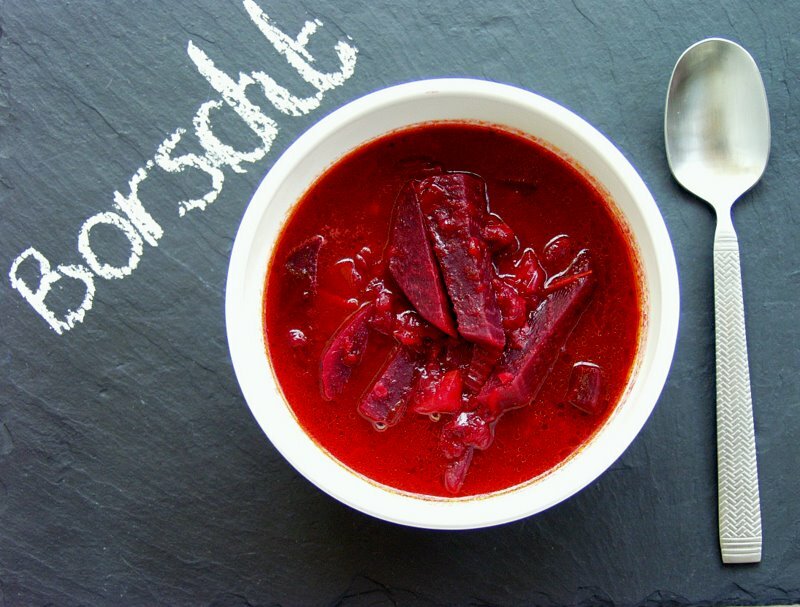 I hadn’t planned on posting this Borscht recipe on my blog. I’ve cooked Borscht numerous times in the past and it’s always been…well…..fine…but never really much more than that. I then found a new recipe in my soup bible called ‘500 Soup Recipes’, ok my secret’s out, I AM A BIG SOUP FAN, but those who follow me I think you kind of already new that, right? Anyway, this Borscht recipe is different from all the other Borscht recipes I’ve cooked in the past, namely that it is not smooth. Instead the beetroot are cut into thick strips, rather like chips in fact, along with the carrots and celery and because of this and the muslin bag full of herbs and spices, gives the soup an added dimension that really makes it a winner. I have followed the recipe loosely but the end result got the definite thumbs up from both myself and Mr B.
Beetroot is easy to find at this time of year and since I had just over half a dozen in my fridge that were beginning to look a little bit sorry for themselves, I decided to dedicate a recipe solely to them, well almost solely! The colour is a brilliant deep crimson and stains like crazy, so unless you like living on the edge, definitely don’t wear white when eating or cooking this dish. As its January Mr B and I are on a bit of a health drive so we didn’t bother with the sour cream, with scattered dill or chives on top. It would have probably made a prettier photograph, but hey my waist line is thanking me for it. Give it a try and please let me know how you get on, I’d love to hear what you think. Do you prefer it to the smooth variety that is more ubiquitous? 1. Peel the beetroot and carrots and cut into fairly thick strips. Also cut the celery into bit sized pieces. Heat the butter in a large pan and when it is melted add the sliced onion and stir on a low heat for 5 minutes. 2. Now add the beetroot, carrots and celery and cook for a further 5 minutes before adding the garlic and chopped tomatoes. Stir into the other vegetables and leave to simmer for a further 2 minutes. 3. Using a large piece of muslin, place the bay leaf, fresh parsley, cloves and peppercorns into the centre and tie the four corners together with a piece of string. Place the muslin into the pan with the end of the four corners sticking out over the top of the pan slightly. Add the stock and make sure that all the vegetables and muslin pouch are submerged as much as possible. Bring to the boil and then simmer for 1 hour 15 minutes or until the vegetables are tender. 4. Discard the muslin pouch and add the cider vinegar. Pour in a little at a time and taste so that it creates the right balance of sweet and sour. Add a sprinkling of sugar if necessary. Season, stir and then ladle into bowls. Add a dollop of sour cream on top with either dill or chives. This entry was posted in Soup, Vegetable, Vegetarian and tagged 500 soup recipes, bay leaf, beetroot, Borscht, Bridget Jones, carrots, celery, cloves, muslin, parsley, peppercorns, sour cream, Ted Smart, tomatoes. Bookmark the permalink.